The Global Volcanism Program has no activity reports for Nevados Firura. The Global Volcanism Program has no Weekly Reports available for Nevados Firura. The Global Volcanism Program has no Bulletin Reports available for Nevados Firura. The Nevados Firura volcanic complex consists of a 10-12 km long, NE-SW-trending cluster of small stratovolcanoes. 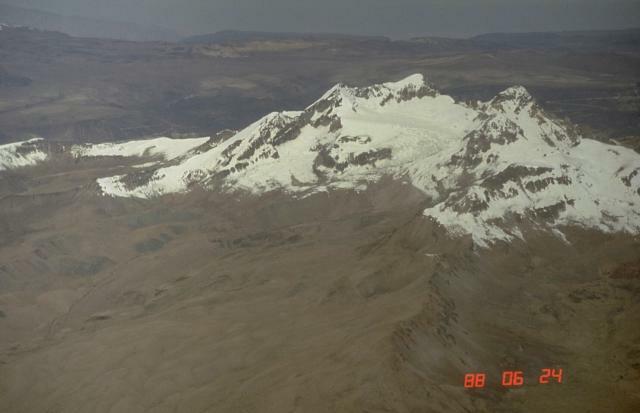 The highest peak is 5500-m-high Nevado Firura itself, which lies to the NE of Cerro Soncco Orcco and Cerro Jahsaya. Little is known about this andesitic volcanic complex, but morphologically youthful lava flows extend into vegetated and settled areas. The age of Nevados Firura was considered to be Holocene (de Silva and Francis, 1990), but later work showed that the young-looking lava flows on the flank of the volcano were dated at about several hundred thousand years (Worner 2006, pers. comm.). The Global Volcanism Program is not aware of any Holocene eruptions from Nevados Firura. If this volcano has had large eruptions (VEI >= 4) prior to 10,000 years ago, information might be found on the Nevados Firura page in the LaMEVE (Large Magnitude Explosive Volcanic Eruptions) database, a part of the Volcano Global Risk Identification and Analysis Project (VOGRIPA). There is no Deformation History data available for Nevados Firura. There is no Emissions History data available for Nevados Firura. The Global Volcanism Program has no photographs available for Nevados Firura. There are no samples for Nevados Firura in the Smithsonian's NMNH Department of Mineral Sciences Rock and Ore collection. Large Eruptions of Nevados Firura Information about large Quaternary eruptions (VEI >= 4) is cataloged in the Large Magnitude Explosive Volcanic Eruptions (LaMEVE) database of the Volcano Global Risk Identification and Analysis Project (VOGRIPA).